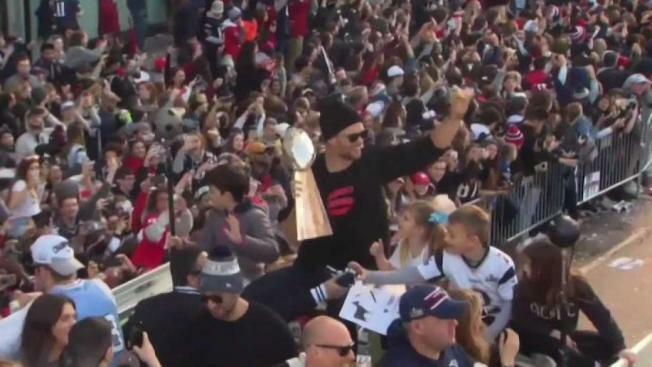 The Super Bowl champion Patriots were honored with a parade through the streets of Boston. An estimated 1.5 million fans jammed downtown Boston on Tuesday for a parade celebrating the New England Patriots' sixth Super Bowl title, clamoring for more with cheers of "We want seven!" and "Next year, right here!" Fresh from Sunday's 13-3 victory over the Los Angeles Rams in Super Bowl 53 in Atlanta, team members and their families took a 2-mile wing through the city aboard Boston's iconic World War II-era amphibious "duck boats." Officials expected more than 1 million attendees, and early trains and subways were jammed, overwhelming the Boston area's transit system with what officials said was record ridership. The weather was unseasonably warm, with temperatures above 50 degrees and dazzling sunshine. Several road closures were in effect for Tuesday's parade, along with parking restrictions on many city streets. Officials urged attendees to take public transportation to and from the celebration. Click here for full details on street closures and parking restrictions. Delays were reported on several different MBTA lines on Tuesday due to the high volume of people heading into the city for the parade. Commuter rail operator Keolis reported trains were seeing high capacity levels due to the number of parade-goers, causing delays of up to an hour in some cases. The company said they expect this to be the highest ridership day ever, notably higher than for previous parades. Additional cars have been added, but increased capacity and potential delays are expected Tuesday afternoon as paradegoers make their way home.